A Night At The Opera inspires memories of Kitty Carlisle and Alan Jones as 2 charismatic young lovers. Their, uh, operatic romance was a highlight of 1930s cinema, overshadowing everything else in this picture. Oh, but the movie was missing a key ingredient. The hilarious Zeppo Marx had retired from acting after his one-of-a-kind work in Duck Soup. A pity. Okay, reverse everything in that first paragraph and you’ll have the truth. Nobody cares about Carlisle or Jones, probably not even Carlisle or Jones. As for Zeppo, the day he gave up his career as a thespian, the film world’s yawn was very loudly indifferent. No, this picture is all about the zaniness of the non-Zeppo Marx Brothers (Groucho, Chico and Harpo). The former vaudevillians overshadowed everyone else who ever appeared in their films. Groucho’s oft-naughty wordplay and Harpo’s silent antics are legendary. Chico never got enough credit for playing off his 2 brothers as well as he did. You can’t talk about A Night At The Opera for even 2 minutes without bringing up the infamous stateroom sequence. The 3 Marxes, various workmen, maids and other hangers-on, all crowd into one small room on an ocean liner. Why they’re all in there and how the situation resolves itself won’t be revealed here. 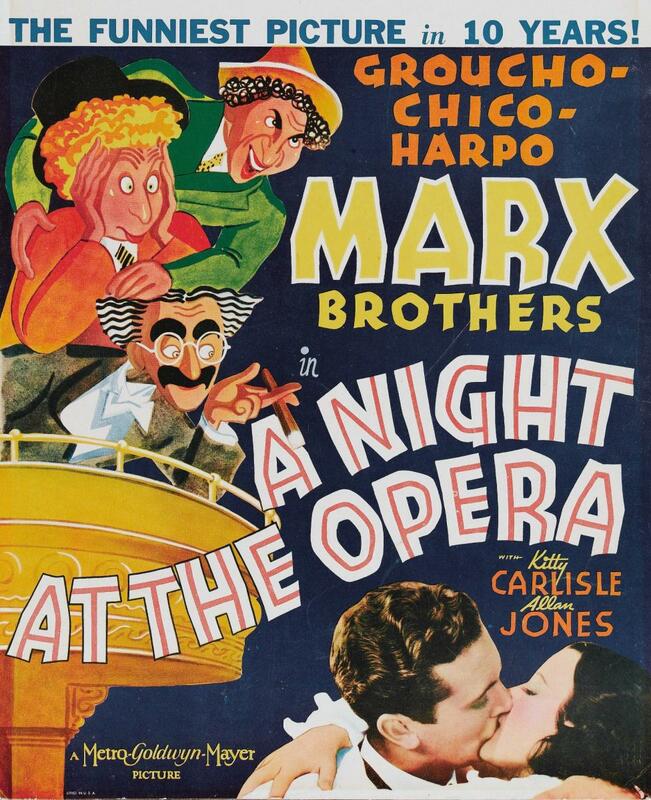 It’s funny and it’s been imitated by dozens of movies and TV shows in the years since A Night At The Opera came out. You probably recognize it even if you haven’t seen this movie. Was that scene and the Marx Brothers typical insanity enough to make this movie worthy of being on the American Film Institute’s Top 100 list in 2007? It’s a dubious choice, especially if your feeling is that a little of Groucho goes a long way. The piano/harp scene by Chico and Harpo is a great one, but it stops the, uh, story cold. So, no, A Night At The Opera is not one of the greatest movies ever made, but it’s not without its charm…and it has Carlisle and Jones! Remember them? Oh. Right. No one does.